In the latest episode of WDF THINKS, we ask an often overlooked question - is Queen Elizabeth I of England (wearer of poofy dresses and smiter of armadas) really all that good at diplomacy? To answer this question, we delve into something of a case study. 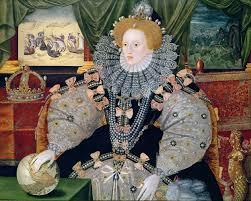 Suffering from Armada syndrome, Liz' achievements are always weighed against the events of 1588. If people think she did well there, then it's all they talk about, if not, then she's written off as overrated before her other diplomatic efforts are even considered. Here, we attempt to right that wrong. With Philip II of Spain occupying all of Portugal as part of his Iberian Union, it seemed fruitless to expect some disinherited Portuguese citizen to try and reclaim his homeland from the most powerful Empire in the world at that time. Yet, that is precisely what Don Antonio, the Portuguese Pretender tried to do, and what was more, he was determined to make use of Spain's rivals, both the English and the French, in order to do it. Don Antonio was one of many pretenders to the Portuguese throne, but he was the only one actively pressuring Paris and London for aid. What follows is a fun episode, as we use the lens of Antonio's experiences to examine how Elizabeth responds to crises, to escalation in tension and to bald threats. Liz's reactions may surprise you, especially if your only version of Elizabeth is the one normally communicated through the Armada legend. Liz was versatile, extremely perceptive and cynical to a fault. She was also tenacious, incredibly irksome when she wanted to be, and made use of Don Antonio's threat to Philip to a degree which must have surprised both the Spanish and her own courtiers. Liz never totally forgot about the importance of keeping the enemy of my enemy close at hand, and she was always available, save for a small gap while Antonio sulked in France, to cook up some kind of scheme. Elizabeth was so effective in her promotion of Antonio because she recognised and accepted the shortcomings of her position, and she worked with what she had at her fingertips to nonetheless create mass havoc for Spain. More famously, she pursued this policy in her sponsoring and alliance with the Dutch rebels, but the Portuguese example provides an arguably better example of her talents, largely because Antonio was as delusional as he was broke, and thus presented far more challenges to Liz' utilitarian foreign policy than the resourceful and wealthy Dutch. A whole load of pretenders, and very few legitimate heirs - no wonder Portugal sighed under the weight of its dynasty's troubles. Ultimately, I judge Liz to be a fine diplomatist, and an underrated one considering how much attention is normally given to the Armada and nothing else. Liz was more than the Armada, but she was also gravely threatened on a scale often understated in the conventional historical narratives. Only through guile and cunning could Liz survive, and she knew this well enough to know that every threat could be a weapon in the right hands, no matter how small that threat appeared on paper. But what do you think? Make sure to have a listen to the episode and let me know what you all thought. Was Elizabeth's reign underrated or perhaps overrated? Do you think she could have done more to support Don Antonio's cause, or was she right to refrain from investing too much? As always, I value your feedback, and be sure to stop on by the Patreon page for this podcast too, where we offer great perks, merchandise and an opportunity to help make history THRIVE! Thankssss history friends! Newer PostThe Korean War Is Getting A Sequel!